It’s a pirate head. Well, most of a pirate head. Jawline up. And he appears to be sleeping. No larger than a baseball, his firey red hear spews in all directions. There’s even a braid or two amongst the locks. Reminiscent of a troll doll, he gently slumbers, one eye patched and the other closed. The detailing in his face is exquisite, the same with his bandana and the beads that hang thereof. But what’s this? 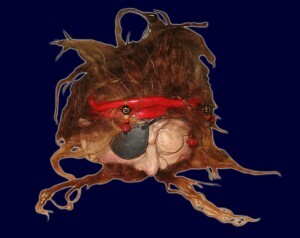 The top of his head lifts neatly off to reveal… well, that depends on what you put inside the last time you opened it. Because, in truth, this isn’t a decapitated sleeping pirate, but rather a jewelry box. Or perhaps a curiosity box would be a more apt term. By the way, did I mention that when you open it, his realistic glass eyes are revealed? Well, they are. And they’re creepy. 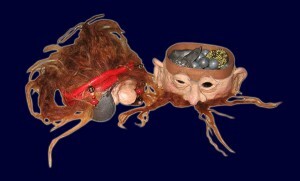 This entry was posted in Other and tagged creepy pirate stuff, surpreyes by Bilgemunky. Bookmark the permalink. that is just plain weird Bilgemunky… not sure i’d want half a pyrate head holdin my valuables.. however… it maybe be the perfect deterrent for thieves or other pirates.. cause would ya wanna see what was in it.. really? Aye, this is definitely the weirdest thing ye ever reviewed, bar none. definitely one of the creepier things youve ever reviewed. Well actually Red Bess I don’t.. And No she ain’t me sister either! LOL Nontheless Eye want one but her site is confusing me as to whare to place an order..I guess I will just -E- mail eerrr. I don’t get it, what does it do now? How many batteries does it take? Does it use black powder or pyrodex?